Carnival or Community Royalty is a long-held tradition that sees young girls and some boys dress up in beautiful gowns and suits for community events such as carnivals, fayres or pageants. Royalty would both represent their town, acting as ambassadors, and compete across regions; in competition, as well as dress and appearance, judging categories would include deportment and poise and conversation. Whilst many towns have lost their carnivals, the tradition of Community Queens continues and our royalty can be seen at events in and around Westhoughton and beyond, organised by dedicated volunteers and leaders, helped by the mums and dads, and the enthusiasm of the girls and boys who become royalty. Every year new charities are nominated and money raised for good causes. The Royalty more than happy to help out and be a feature of local events. Up until its demise in 2006 the crowning of our Carnival Royalty was a highlight of the Westhoughton Carnival. However, after a lull, in recent years thanks to the efforts of groups within the Westhoughton Community Network there are events - big and small - that take place throughout the summer months, and people get the chance to see this fine tradition. The girls and boys who get involved enjoy dressing up and being a part of this vibrant community at events, or out and about such as visiting old folks homes. Those who are involved form friendships and grow in confidence. It was the 2014-15 Community Queen herself who did the presentation in front of a room full of people for the successful Westhoughton You Decide funding bid. Currently, activities include competitions: two per year (own group); there are two competitions a month across the North West and in the summer months there are the carnivals and events. It is a sociable affair with parents joining in to enjoy days out and trips. There will be stalls and tombolas at events to raise funds for the chosen charities, a sponsored walk from Botany Bay (2016), psychic nights, supermarket bag-packing sessions, and stall tombolas… through this Westhoughton Community Royalty can raise significant sums. (In 2016 Manchester Children's Hospital, Wigan and Leigh Hospice and Bolton Hospice shared £2,454). A special Presentation Evening is held to hand over the money to the chosen charities. Adding some colour, Community Royalty are often present at the popular Friends of Eatock Lodge Family Funday held in early September, with the girls in their dresses and running a stall raising money and giving a chance to visitors to find out more about the group. Photos from the day on the Eatock Lodge Facebook group. Petals – little girls less 5 years old. Rosebuds – 5 to 7 years old. Page Boys - 10 years old and under. Princess – 8 to 10 years old. 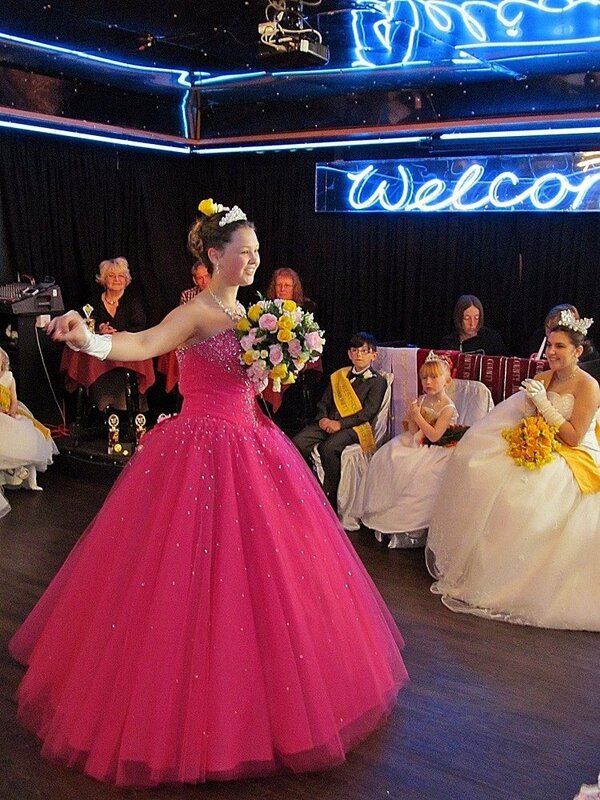 Junior Queens – 11 to 13 years old. Queen - 14 years and above. There will be deputies to stand in should the Queen not be available. Community Royalty is for one year with an annual crowning / change of royalty event. This year it will take place as part of the Westhoughton Yarn Bombing Festival at Westhoughton Leisure Centre on Saturday, 2nd July. Is it expensive? No more than other social activities. Dresses which can be bought new or second-hand can be purchases from between £20 and £150. Taking place at The Mercury Hotel, 540 Manchester Road, Westhoughton BL5 3JP, the competition is for selections across all categories for 'royalty' duties for the coming year. Categories being : Pageboy (4 to 10 years); Petal (2 to 4 years); Rosebud (5 to 7 years); Princess (8 to 10 years); Junior Queen (11 to 13 years) and Queen (14 years and above). Selection starts at 3:00pm. Free entry for Selections. Dress code is smartly dressed. Current royalty will show participants how to curtsy/bow as per normal conduct. On the day, those children selected will also be given details of the upcoming events and meetings. Your involvement and support keeps the tradition alive and this popular spectacle in the public eye. All are welcome to join us. Contact Sandra Greenall for more information on 01942 814535. 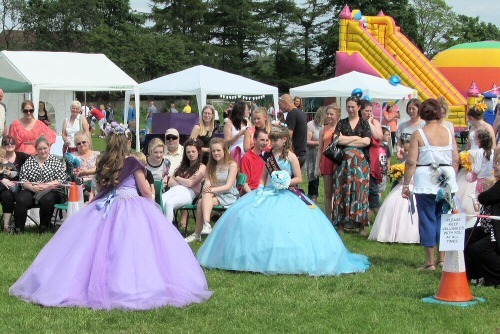 Westhoughton Community Royalty have always been integral to community events from the days of Westhoughton Carnival which last took place in 2006. 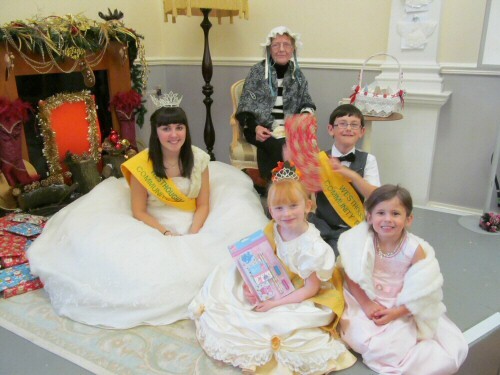 The community has since come together in other ways, with large-scale events such as: Howfenfest, It's A Knockout, the Yarn Bombing Festivals, Eatock Lodge Fundays, John Holt Showcase Days, and special events at Westhoughton Market where the girls (and boys) still uphold the tradition of community royalty. In addition, they are often seen at smaller school fayres over the summer, and beyond Westhoughton they will represent the town in regional competitions as part of a still-thriving royalty circuit. During the 2015 Westhoughton Yarn Bombing Festival weekend, community royalty brought back a taste of the old carnival with a float tour parade through Market Street and around the town centre area - local character 'Billy P' providing the transport. Decorated vehicles could be viewed at the White Lion car park with visiting royalty joining the Westhoughton contingent. Organisers with the support of participating parents work hard to ensure that royalty is presented well, and that the tradition lives on. New people are always welcome, as are participants in the various classes. 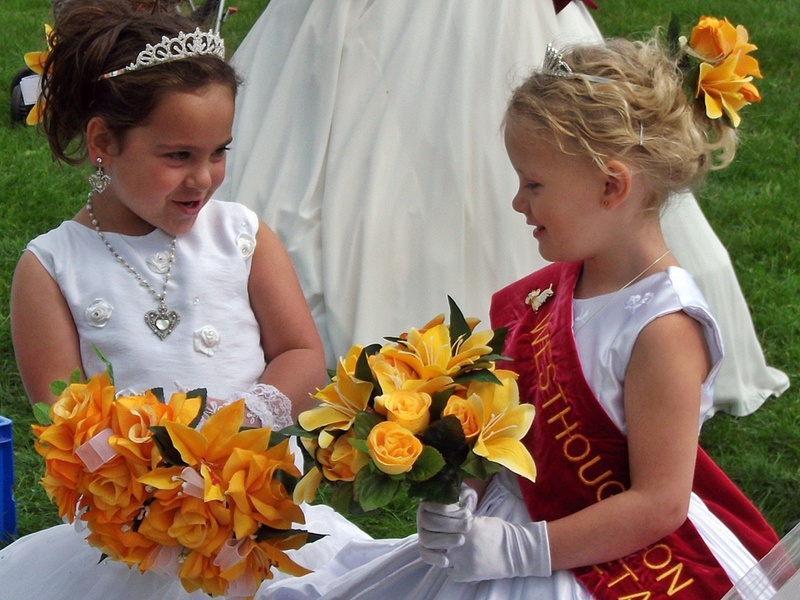 These regular royalty competition usually take place in the early summer and cover all categories, with visiting royalty from Horwich, Chorley and Adlington (towns that continue with their carnival traditions) joining the Westhoughton girls and boys. Trophies are given for 1st place and certificates for 2nd and 3rd places. Any money raised on the day goes to two local charities. Download info sheet (example from 2015). Main contact Sandra Greenall (Chair).